I always look forward to a new Narelle Oliver book and her latest, ‘Don’t Let a Spoonbill in the Kitchen’ does not disappoint. PudStar and I attended the launch of this book recently and it was fabulous and launched by the Governor-General of Australia, Ms Quentin Bryce AC CVO. Ms Bryce has been enamoured with Narelle’s work for many years now and she owns several pieces of original artwork from various Narelle Oliver books. You can read more about the Spoonbill launch here and more about Narelle Oliver here. In ‘Don’t Let a Spoonbill in the Kitchen’ Narelle Oliver has used hand-made collages of linocuts, paper and photographic elements to create a visual delight which young and old alike will pour over. Narelle’s trademark linocut Australian animals (in this case birds) are laced with a healthy dose of humour and the result is a delightfully ridiculous romp for young children. Australian birds are first pictured in their natural habitat and each of their characteristics are described in rhyming verse. 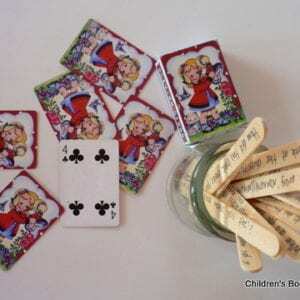 The text is lovely and works so well as a ‘read aloud’, the rhyme and rhythm rolling off the tongue. The following double page spread places the birds in the most ridiculous settings…with disastrous results! Spoonbill birds are placed in a very funky kitchen with their spoon-shaped beaks creating cupcake chaos and the Jacanas, with their long wide feet so fabulous for balancing on lilypads, are taken to a shoe shop to destroy a few displays. As always, it is Narelle’s artwork which has made her a multiple award winner and which draw you in to each of her books. 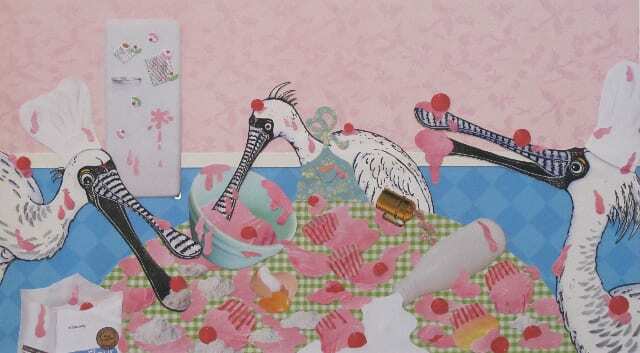 I would very much like a large print of the first double page spread with the Spoonbills creating chaos with cupcakes. As an avid baker those cupcakes look most edible, and the retro-themed papers used for the backgrounds are both on trend and timeless. The eye is drawn to the birds in each scene through clever use of colour; the birds are primarily black and white whilst the surrounding scene is busy, colourful and full of intended chaos. The endpapers on the hardcover edition are a bit spectacular and being a lover of small and colourful treasures, PudStar has spent a large amount of time pouring over these. Narelle Oliver is one of the very few artists in Australia to use lino cutting as her primary book illustration technique. She has perfected her craft over many books and countless years: painstakingly carving her sheets of lino in her studio. I have had Narelle Oliver as a guest speaker at school on a number of occasions and students are always fascinated by her carved lino blocks and the printing process which she often demonstrates. She also allows the students to get involved during workshops. If you don’t know of Narelle Oliver, click very fast now. 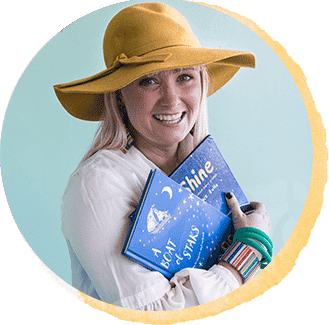 For new babies I love to purchase a copy of ‘Baby Bilby Where Do You Sleep?’, for friends who have moved overseas I purchase a copy of ‘Home’, for students studying Australian explorers or the Australian desert ‘Sand Swimmers’ is a must. For amazing examples of camouflage in nature and the dangers of vanity ‘Fox and Fine Feathers’ is fabulous and for older children (and adults) who love tales of mermaids, ‘Mermaids Most Amazing’ is fascinating. 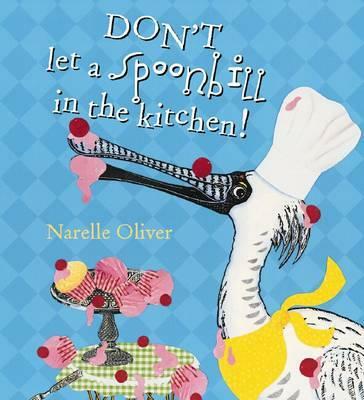 ‘Don’t Let a Spoonbill in a Kitchen’ is perfect as a gift for young children and is a must in a school library. The scope and sequence of ‘The Australian Curriculum: English’, states within the ‘Literature and Context’ sub strand for Year Three, “Discuss texts in which characters, events and settings are portrayed in different ways, and speculate on the authors reasons.” (ACARA, 2012). Spoonbill can be used as an example of putting characters (the birds) into an unusual setting. 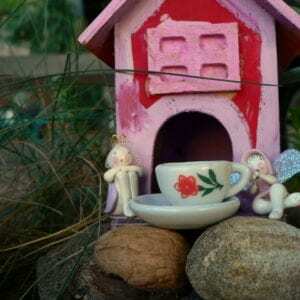 Why might Narelle Oliver have done this (humour, idea of habitat)? Using books from your school library or the Internet, research each bird; spoonbill; cormorant; pelican; jacana; stilt; osprey. Consider the natural habitat of each bird and then discuss why each should stay in its natural habitat (with the chaos they create as stimulus). Why is a kitchen a great place for people, but not so great for a bird? Discuss habitat and what this word means. This book is a light-hearted and a flight of fantasy, but also a great introduction to habitats and why they are important. There are many other books where animals try to take on human characteristics or enter a human habitat with disastrous results. My favourites are ‘Why Do I have to Eat Off the Floor’ and ‘Don’t Let a Possum Into the House’. Write a list of other native animals. Discuss their characteristics. If we use our wildest imagination, where could we put them that would use those characteristics in a funny setting? Choose one of the animals discussed. Narelle Oliver is very particular about the features of her animal illustrations and does much research and often visits the animals in their natural habitat to observe them. Using photographs and known characteristics of your chosen animal, sketch the animal in as much detail as possible. Carefully cut out and use your animal sketch as part of a colourful collage with your animal in a humorous setting. Research Narelle Oliver. Her website is an excellent place to start. Read some of Narelle Oliver’s other books, your school library will have many. Do you notice recurring themes? An author study is an excellent way to help children identify with favourite books and authors, a sub strand in the ‘Responding to Literature’ sub strand of ‘The Australian Curriculum: English’. The title of each of the books listed take you to the Australian based online bookstore Booktopia. If you live in the US or would prefer to use Amazon click here. If you live in the UK or would prefer to use Book Depository click here.